Aarav's journey to hearing......: Tuesday - 15 weeks old..
1 - Was Aarav the same person last week??? He says a-oo in two separate syllables. It means “Don’t want” or “don’t do”. He may not use if often but he does know it well and understands it when we use it too. Enough in Marathi. He uses it well. That's one of his first True Words!! To show something is dirty. Aarav now signs environmental sounds as well.. 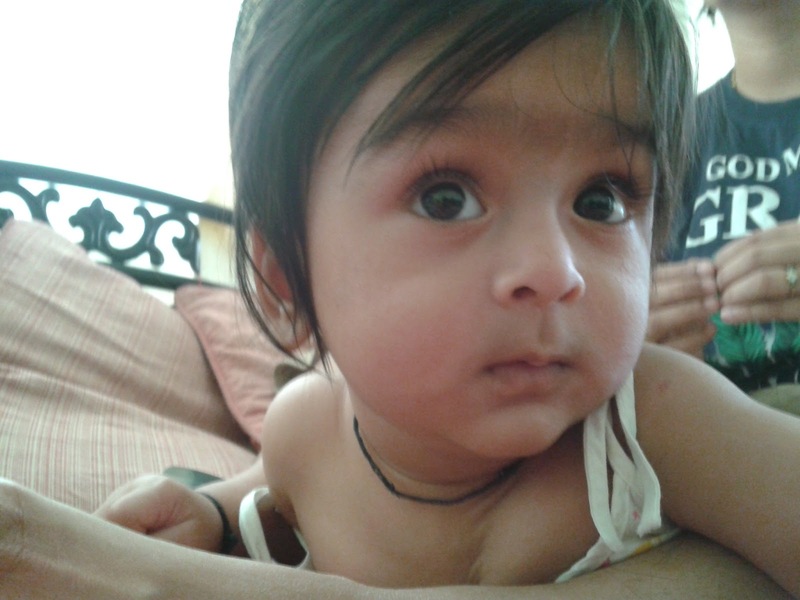 The other day a bike zoomed across the window, on the lane near our house, Aarav signed that he heard the sound. No, I don't think he was able to correctly identify it yet, but he DID hear it above all background noise and told us that too!! 3 - Understanding basic commands..
W position (legs folded, but outside making a "W" shape). So to make him sit properly, we have to remind him that he is supposed to sit with his legs folded properly. We still have to tell him 5-6 times, and I think he understands the command more because we repeat it till he gets it. He probably reads our eyes and body language.. But, Still. He does get it now. 4 - Aarav got a new School Id !!! 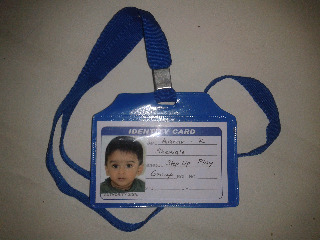 Aarav is now going to Preschool.. This is his very first School Id card!!! 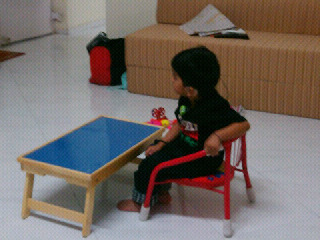 He sits on it dutifully to have a snack or to watch tv.. If I give him a plate of food to carry out from the kitchen, he carries it to the table, then drags his squeaky chair and then has his food. I swear that it would be easy to feed a crazed hungry Lion than a crazed hungry Toddler!! At least the lion would chase the food... here the situation is quite the opposite..
And when he does eventually get caught, he practices his Sumo-moves to either escape ..
And if the said food morsel is the right combination of tasty looking bits put together, that suits his palate at that point of time, then and only then he will eat it..
Who needs a gym session? Dinner time used to be cardio enough. And less picking up stray pieces..
And with table manners came an added benefit?? A bit less ducking and avoiding the sudden spurts of loving-bear-hugs that he insists on. Good.. hope these table manners last for loooong.. Yesterday we had therapy and mapping. We discussed the second CI. This blog post was due the very next tuesday, was never completed on time.. I have uploaded this 'as is' now, without any more additions..